John Wick has it all: a killer suit, a job he loves, and an adoring family. Oo, uh… you know, nevermind on that last one. Still, two out of three ain't bad. And it looks like in John Wick: Chapter 2, our favorite sharp-dressed, long-haired assassin will get to add "international travel" to his list of enviable traits. What a lucky guy. 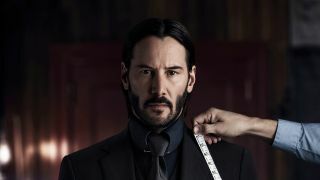 While the teaser doesn't tell us anything new (we're aware of Wick's fashion sense, and the fact that he'll be making a trip to Rome), but it should still serve to get the blood pumping. Of course, if that little tease wasn't enough for you, fret not: a full-length trailer is set to debut this Saturday at New York Comic-Con.